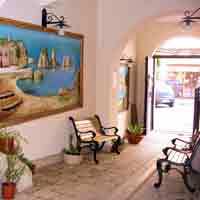 In the heart of Castellammare del Golfo, close to the municipal park and the town's impressive tourist port, the hotel has a great location in the western part of Sicily, for a relaxing holiday and is a good base for exploring all that the region has to offer.Locanda Scirocco is a pleasant inn in a palace of the 18th century, steps from the historic centre. 14 rooms, 8 rooms and 1 apartment for 5 people are situated in the main house, and 5 rooms are located in the annexed building, which is less than 120 metres away. The decoration of the rooms in the main building matches the beautiful architecture and the authentic floors of the palace. All rooms have a private bathroom, hairdryer, air conditioned/heating system, phone, TV and bar-fridge.